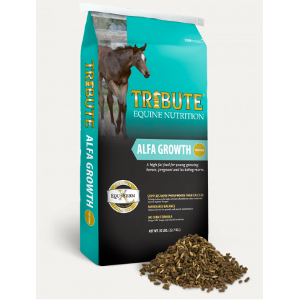 A higher fat, textured feed formulated for young, growing horses and pregnant and lactating mares consuming forage that is more than 50% legume. Supplies more phosphorus than calcium to help balance the high calcium:phosphorus ratio commonly seen in higher legume forages. Optimal balance of essential amino acids, organic minerals, fatty acids, and antioxidants to meet all nutritional requirements, for healthy hair coats, support of normal bone and tissue growth, and support of muscle growth. Higher fat, highly digestible fiber for healthy calories.